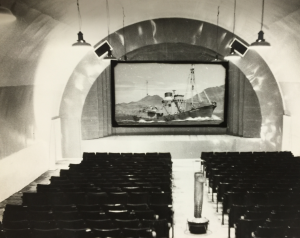 This look at cinema and film offered to the personnel of the whaling stations in South Georgia is another of our occasional forays into the Salvesen Archive. Papers in the Christian Salvesen Archive show that cinema was an important leisure-time activity in the life of the personnel working at the whaling-stations of South Georgia. Films could be enjoyed at the ‘World’s Most Southerly Cinema…’. Collection of season programmes for films at Grytviken Kino, South Georgia, 1960s, a cinema claiming probably correctly to be the ‘World’s most southerly cinema beyond the cinema at Ushuaia’, Argentina. In the Salvesen Archive, B2, Box 4, h.
The earliest reference to ‘cinema’ in South Georgia so far found in the Salvesen Archive is a letter from the 1920s. A copy-letter (unsigned typescript) to Edward B. Binney, Magistrate, South Georgia, dated 28 November 1925 – and presumably from the Leith Harbour station – is in effect an application ‘for permission to give Cinematograph Exhibitions’. The letter states that the ‘Cinematograph is the property of all the employees’ of the station, and that a subscription of 15 kroner is ‘being made by each man to cover cost of Machine and Films’, and also the cost of ‘books for a Library’. Proposed layout for the new Cinema, 1956. In the Salvesen Archive, C5. Box 2. The letter goes on to state that the ‘Company provides the Buildings and electric Current free of charge and every precaution has been taken against the outbreak of fire’, not least through the locating of the building ‘away from the factory’. Finally, the letter tells us that: ‘Each man takes a turn to keep the building in a proper state of cleanliness’. Indeed, at Leith Harbour, wrote Sir Gerald Elliot in his work A whaling enterprise (1998), the main recreations ‘came from the cinema, the library and the football ground’. 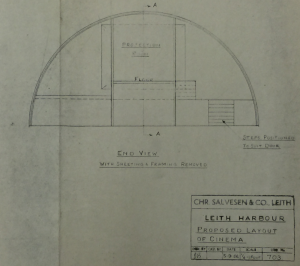 The cinema, the library, and football field were ‘the normal amenities of civilisation’ agreed Wray Vamplew in his work Salvesen of Leith (1975). The cinema, Elliot went on, ‘got a new supply of films every season which were exchanged with the floating factories as opportunity arose’. By the mid-1950s: ‘There was a large new cinema about to be built’. Examples of the variety of films acquired for the stations have been found in the Salvesen Archive. A copy-note [Norwegian] from Oslo dated 24 January 1955, and relating to 10 films sent to South Georgia in Winter 1955 via shipping agents Messrs. Ruys & Co., Netherlands, and the Fred Olsen Transport Co. A/S, lists the titles Asphalt Jungle (Asfaltjungelen, 1950), No No Nanette (Nei, Nei Nanette), Operation Pacific (1951), and Rocky Mountain (1950) among others. The films were destined for Grytviken Kino, South Georgia. List of films sent south to South Georgia from Oslo in January 1955. In the Salvesen Archive, B2, Box 4, h.
Another letter [Norwegian] from Europafilm A/S, Oslo, to L. Klaveness A/S, Sandefjord, dated 18 January 1957, refers to the delivery of 10 films for Grytviken, 1957 Winter Season. 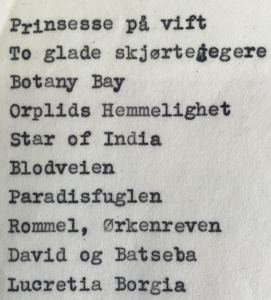 The films were to be sent south from Oslo on 29 January 1957 on the vessel Kronprins Olav. 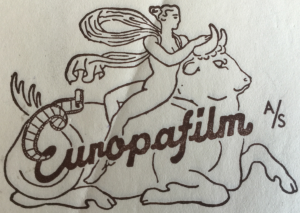 Europafilm A/S, Oslo, supplied 10 films to Grytviken Kino in January 1957. In the Salvesen Archive, B2, Box 4, h.
The films sent south in 1957 included Bird of Paradise (hopefully the 1951 re-make rather than the much earlier 1932 one), Botany Bay (1952), David and Bathsheba (1951), Desert Fox: the story of Rommel (1951), Roman Holiday (Prinsesse paa vift, 1954), and Star of India (1954) among others. List of films sent south to South Georgia from Oslo in January 1957. 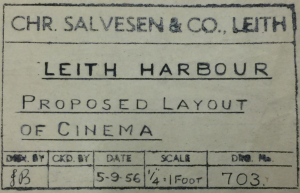 In the Salvesen Archive, B2, Box 4, h.
It wasn’t only the crews of the floating factories that enjoyed the exchange of films with the shore-based stations… films were exchanged between the various shore stations themselves. 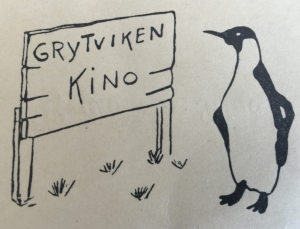 In the Archive there is a note [Norwegian] from Grytviken Kino to Husvik station cinema, dated 20 February 1960, indicating that a number of films were on the way to Husvik. The same note asks Husvik ‘to please send [back] remaining films of previous lists’. Grytviken Cinema membership card. 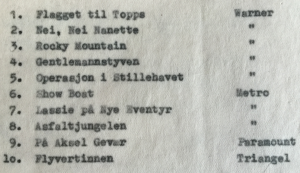 In the Salvesen Archive, B2, Box 4, h.
Another note [Norwegian] from Grytviken Kino to Husvik, dated 7 November 1961, indicates that ‘more new movies will be sent tomorrow’, and that these should be sent on to Leith Harbour as well. The note also asks that films already watched be returned to Grytviken. 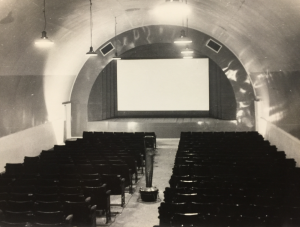 In addition, the note states that the ‘film company in Oslo has asked us that care be taken of all the large coloured cinema posters inside the film cans and to make sure they don’t get lost, otherwise they will have to be paid for’. Interior of a South Georgia cinema. 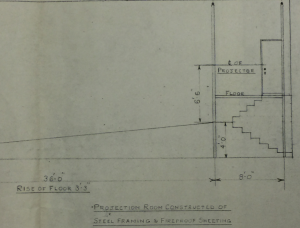 In the Salvesen Archive, C1, Envelope 30. With the ending of commercial whaling and the closure of the South Georgia stations, infrastructure there has been open to the elements. 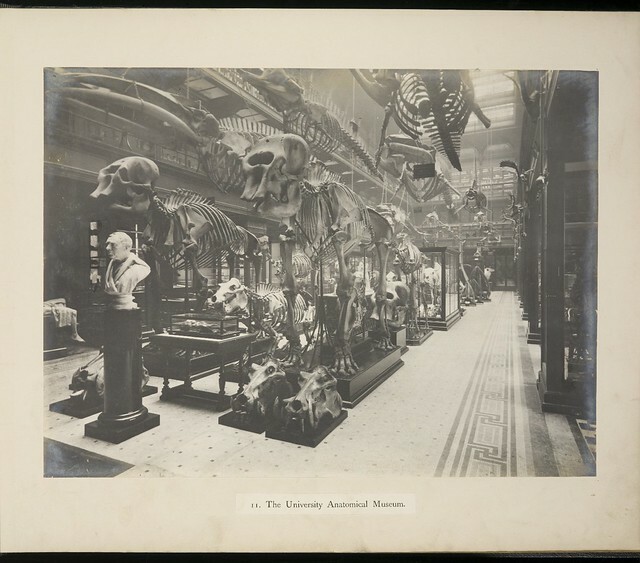 A 2011 report on the state of the whaling-stations shows that the cinema buildings have not faired well at all, succumbing like the other flimsy structures to the storms and weather conditions of the Southern Ocean. The cinema venue at Grytviken (a whaling station of Compañia Argentina) has gone – or is at least not referred to in a list of surviving buildings – and at Husvik (established by the Tønsbergs Hvalfangeri) the cinema and library were ‘in a state of collapse either partial or complete’. At Stromness (first established by the Sandefjord Whaling Company) the cinema is listed as one of the buildings that ‘have collapsed completely’ , and at Leith Harbour too (the Christian Salvesen station) the cinema is among those buildings ‘in a ruinous state’. 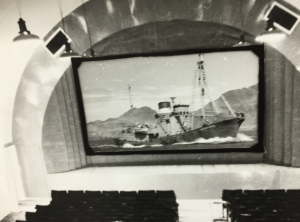 At Prince Olav Harbour (Southern Whaling & Sealing Company) the cinema has ‘disappeared completely’. Salvesen of Leith, Wray Vamplew, p.213, published by Scottish Academic Press, Edinburgh & London, 1975. A whaling enterprise. Salvesen in the Antarctic, Sir Gerald Elliot, p.66, p112, published by Michael Russell, Norwich, 1998. Inspection of the disused shore-based whaling-stations for the Government of South Georgia and the South Sandwich islands, by Purcell Miller Tritton, Norwich, July 2011. This entry was posted in Collections and tagged Christian Salvesen & Co. Ltd., Salvesen & Co., Salvesen Archive on 05/08/2016 by eddiegd.